I found an overprint bug in Affinity Designer 1.6.1 (from App store). 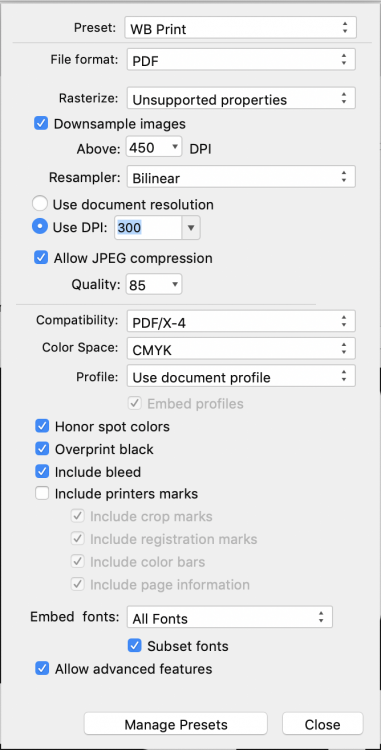 2. export or using slices with "Overprint Black" checked will actually set all colors to overprint, even when the colors are not set to overprint in the original file. There is rarely a case that anything should overprint other than black. 3. This only happens with EPS files. As you can see in the screenshot from Acrobat that the PDF to the right did not overprint but is correct. Unchecking the box "Overprint Black" in the More dialog box will enable it to not overprint all the other colors but that is just a workaround and could cause other problems. I could not replicate this. Any chance you can attach a screen recording of your workflow and the .afdesign file in question? I have attached the files, logo, and video. The bug is that the EPS is an embedded object. Double-click on it, copy the whole "page" that opens in a new tab. Close the edit window for the embedded object. Delete the embedded object, paste the copy, group it. resize and place it where it was originally. For helping to resize, I usually drag three guides down: top, bottom and left side. Makes for quicker resizing to the original and placing it in the same location. Yes, that's correct. The bug is how the eps is handled. If I take the original artwork, or the PDF of the original artwork, it is fine. There are times that you really need an an embedded vector EPS rather than the art so that it accidentally doesn't get changed, too many vector objects, or if you don't have the fonts on your system. For some reason it is overprinting the red even when it's not set to be overprinted as a color or as an object (originally made with illustrator). Embedding doesn't solve the missing fonts issue. They will be substituted without warning. Grouping resolves accidental change. It acts exactly like an embedded object for all practical purposes. How are you checking the overprint issue and with what version, the embedded object or one that is not embedded? fwiw, it isn't the red being set to overprint. It is the black outer circle. It is being treated as filled when Simulate Overprint is checked in Acrobat. Unchecking that option reveals the true logo as regards the overprint of black. This may be an error in Acrobat from version 10 onward. It does place and appearance is correct in ID & QXP. It opens for editing correctly in XDP, CD and QXP. Wanted to leave the above reply. 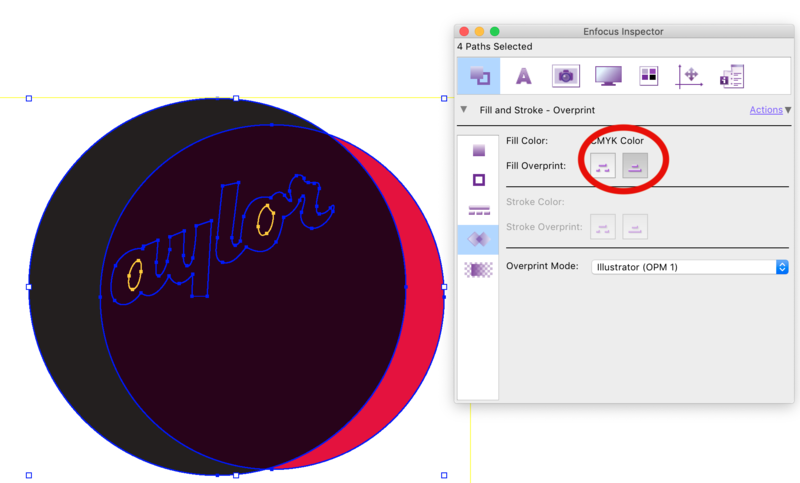 But I was incorrect about the red circle not being set to overprint. It is. 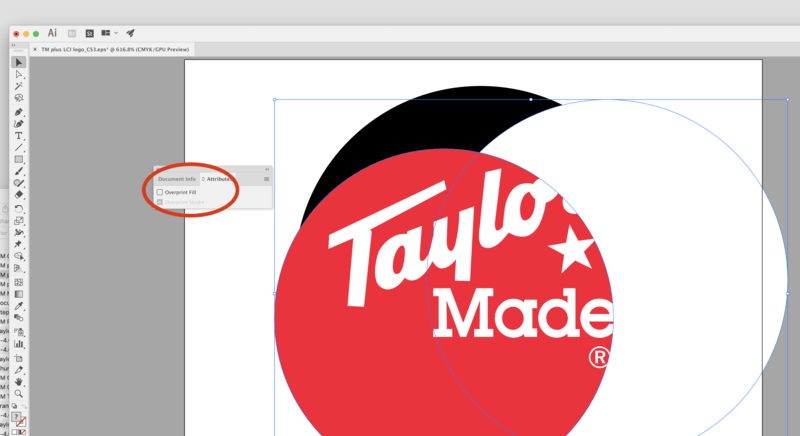 I had pulled the group apart in Acrobat to separate the logo objects and once that is done, the transparency group alters the overprint attribute. I do not ever embed other objects. Embedding objects has resulted in other issues. 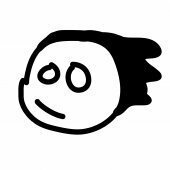 It's a nice idea run amok, I think. This applies to non-EPS graphics too. It can/does apply to even embedding AD files. And being in the prepress/printing industry, which I am, I have to check for improper overprints all of the time before it gets to press. If Indesign and Quark are both correct when exported and it only happens with when the PDF is exported with that option selected in Affinity Designer, then the bug is clearly in AD. The problem is not in Acrobat. Acrobat is just showing there is a problem. It's like your check engine light being on in your car so you remove the bulb. The check engine light wasn't the problem, it was alerting you to a problem. The logo is actually made of three separate objects with three separate fills. The black is not an outer ring it's a completely filled circle just like the white and red is. As you can see below it is not set to overprint in Illustrator. That includes the white too. It's also not just black. Red, and white are also overprinting. Every color is now overprinting after the export. IMO, Overprinting really should be called underprinting because it allows everything else to print underneath the object, which is generally what you do not want. I think it would make more sense to people designing. I wish designers couldn't set the overprints because they will soon be clicking overprint for objects and not realize what the outcome is. That is why I tell every designer to make sure you have overprints preview turned on. Yes, I corrected my post above. The issue is only with the embedded document model. And yes, Serif needs to fix the issue. If I recreate the file in AD so that I am not starting with the original, save as an AD file and place that as an embedded document, the same thing happens. It is not limited to the EPS file you are using. I think I hit reply about the same time you did and the responses crossed. I have been trying to get people to move towards Affinity. It needs a little polish but overall I use it regularly to fix Indesign exported PDF's. It's interesting that it doesn't happen to the PDF embedded but it does happen to EPS and AD embedded files. Thank you all. I have logged it with our developers as a bug.